Taipei Taiwan(Nov 1, 2018) –Plustek INC, a leading manufacturer of the document, film and book scanners, announced today the launched of its new eScan A350. This new standalone network scanner is priced at $999. The eScan A350 has a built-in seven inch LCD touchscreen with a smartphone-like Apollo interface. Its intuitive user interface (UI) makes it easy for everyone in the office to enjoy scanning immediately. Once the oversize Apollo button has been touched, the scanned thumbnail image shows up for a quick review. Fast Edit is also available when needed, in order to make some quick tweaks such as crop, rotate and contrast. As for sending, Apollo’s touchscreen offers a variety of destinations including: all the popular cloud providers, email (fax), FTP, mobile device, PC, network folder, USB drive and even to multiple destinations. The nature-inspired "feel" was designed into Plustek’s Apollo UI; going beyond the simplicity of smartphone. Thanks to the big touchscreen all the elements are arranged intuitively and refined in detail. Apollo master button is surrounded by four setup planet buttons for easy setting changes from a single screen. "We’ve reduced the complications of a multifunction system by bringing back the simplicity of sending a fax," said Susan Chueh, Marketing Manager, about the eScan A350. 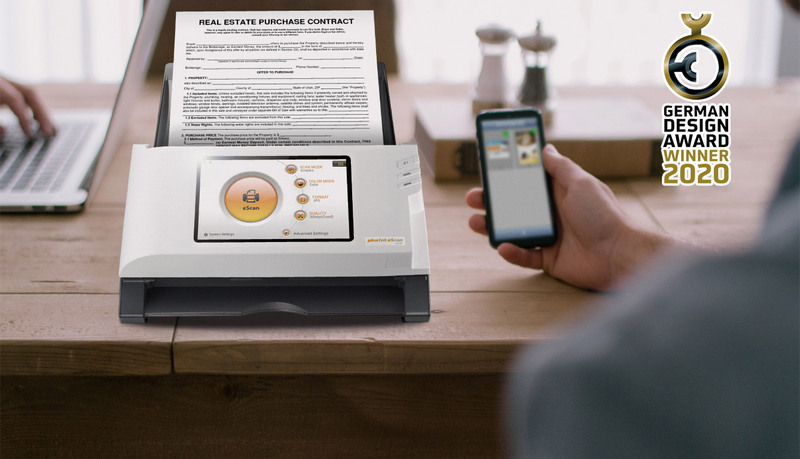 "This value packed standalone scanner is priced for consumers."